Pre-conquest, some of the indigenous peoples of what is today Mexico had decisionmaking structures based on participation, discussion, and consensus, hallmarks of modern anarchism. Today, indigenous community assemblies and collective decision making inform some Mexican social movements of the left 'and below,' such as the Zapatista Army of National Liberation, and these practices have a large influence both on Mexican anarchism and anarchists in the United States and internationally. In 1824, the utopian socialist Robert Owen unsuccessfully tried to acquire a district of fifty leaguesto develop a colony in the Mexican provinces of Coahuila and Texas along the same principles set forth in New Harmony. His request was eventually denied by the Mexican government. In 1861 the Greek Plotino Rhodakanaty tried to implement the ideas of Fourier and Proudhonduring the administration of President Comonfort. He published Cartilla Socialista a manual explaining the ideas of Fourier. Some of his adepts like Francisco Zalacosta, Santiago Villanueva, and Hermenegildo Villavicencio, became the first worker's rights activists in Mexico. Other students of Rhodakanaty founded a school called "La Social, Sección Internacionalista" followingBakunin. These activists organized one of the first mutualist societies in Mexico. Mutualism is the preferred term for anarchism by the Mexican authorities. Around 1882 another anarchist group was founded by the brothers Enrique and Ricardo Flores Magón. They published the newspaper Regeneración in 1901. Their movement is oft-cited as a precedent for the Mexican Revolution of 1910. Other famous leaders of the Magonista movement were Camilo Arriaga, Juan Sarabia, Antonio Díaz Soto y Gama and Librado Rivera. In 1869, student Chávez López wrote one of the earliest anarchist manifestos. The motto of the manifesto: "soy socialista porque soy enemigo de todos los gobiernos y comunista porque mis hermanos quieren trabajar las tierras en común translates as "I am a socialist because I am an enemy of all governments and I am a communist because I want to work our common lands with my brothers". Dispossessed peasants in central Mexico supported these ideas. The Mexican Anarchist Federation (sp: Federación Anarquista Mexicana) was a Mexican anarchist organization that existed from December 28, 1945 until the 1970s. It appeared as the Anarchist Federation of the Center joined with the Anarchist Federation of the Federal District. It published the periodical Regeneración. It received the help of recent Spanish anarchist who sought refuge in Mexico who escaped from Francisco Franco´s dictatorship. Shortly after its establishment it gained the attention of the Mexican police forces and the Mexican government after some Spanish exiled anarchists along with members of the Mexican Anarchist Federation were arrested after trying to rob a truck that carried large amounts of money from a beer industry. 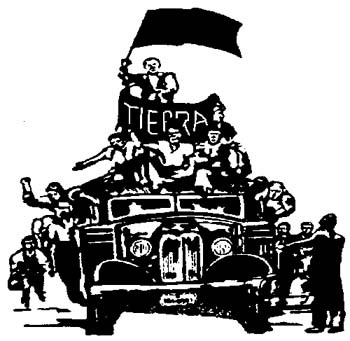 Also linked to the Mexican Anarchist Federation was the Libertarian Youth (sp:Juventudes Libertarias) and the publication Tierra y Libertad. ^ R. Owen Robert Owen's opening speech, and his reply to the Rev. Alex. Campbell. Part fourth.